Your ability to communicate powerfully is your most important professional skill. For building trust, influencing stakeholders, and attaining your business goals, developing your speaking skills is a smart investment. After all, when it comes to moving key audiences, you can't stand outside yourself and judge how you're doing. As a New York stage actor and speech coach, I created The Genard Method of theater-based speech training to produce exceptional business communicators. You won’t learn how to act, but you will discover how to use your instrument—yourself—to speak with exceptional comfort, confidence, and credibility. You’ll be more focused, expressive and audience-centered, using body language, stories, and a more dynamic voice to motivate and inspire listeners. Developing a performance persona for leadership. Transitioning into a new role with more visibility. Pitching your products, services, or vision. Improving your vocal skills and stage presence. Strengthening your ability to deliver a powerful message. Conquering fear and enjoying public speaking. Job or promotion interview preparation and practice. Skills in persuasion with prospects, customers, clients, and boards. Motivating and activating employees and stakeholders. Book tours and publicity campaigns. Using body language and nonverbal communication effectively. Becoming a memorable speaker who reliably produces results. "This was amazing! You’ve really opened my eyes to areas for improvement. I spoke fearlessly and with much more presence at the conference you prepared me for. In fact, I have never felt better after a presentation. I can’t thank you enough for your help. You are indeed the best!" The Genard Method training is always tailored to your goals and abilities. Executive speech coaching is offered as an eight-week course for Boston-area professionals, or a two-day intensive for out-of-state or international clients. My corporate Voices of Leadership training is a two-day on-site training for leadership teams. Need intensive preparation for an upcoming talk, job interview, or media appearance? We offer short-term Presentation Coaching in addition to the above programs. Take a look at the blue box at the top of this page to see which program best suits your needs. And if you don't see what you're looking for, let's talk, because executive-level coaching should always be personalized to your career goals. I look forward with pleasure to hearing from you! 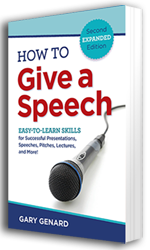 Your go-to guide for dynamic public speaking. Now available as an audiobook.